Is it safe to use eggs that have cracks? 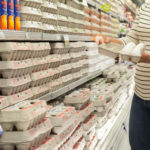 Never purchase cracked eggs, because bacteria can enter eggs through cracks in the shell. If eggs crack on the way home, break them into a clean container, cover it tightly, keep refrigerated, and use within two days. When preparing, be sure to cook eggs thoroughly, with both the white and yolk firm. Tip: Always check eggs for cracks before buying them at the grocery store.